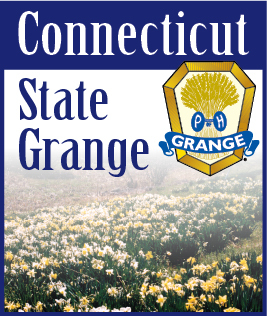 The Grange Scrapbook is a collection of photos, images, and articles of historical interest to the members of the Connecticut State Grange. Use the button above to select an area of interest, and the scrapbook will display groups of images relating to your selection. To view the items within that group, click on the image displayed. The "In The News" group contains images from news articles related to your selection, organized by month and year. The scrapbook is an ongoing project, and we invite our visitors to contribute photos, clippings, and articles of people, events, and memorabilia that is of historical interest to members of the Connecticut State Grange. We would also like to hear from you if you can help identify some of the people or events already displayed in our scrapbook. If you would like to contribute to our scrapbook, please contact us.